Observations on film art : Do filmmakers deserve the last word? Do filmmakers deserve the last word? On 3 December 1913, the above advertisement appeared in the New York Dramatic Mirror. 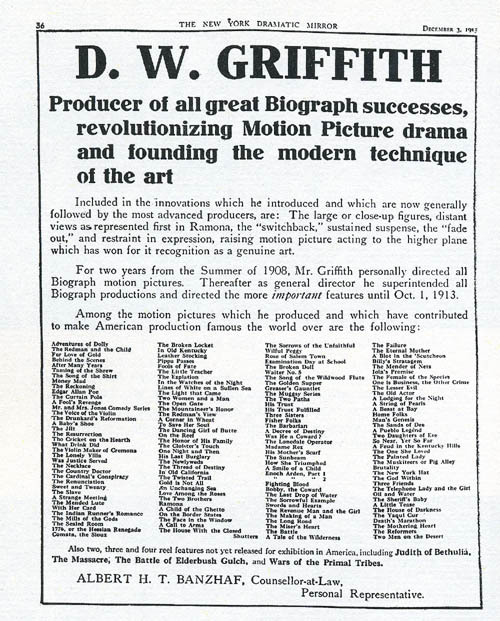 D. W. Griffith had left the American Biograph company and set out on an independent path that would lead to The Birth of a Nation and beyond. Because Biograph never credited directors, casts, or crews, he wanted to make sure that the professional community was aware of his contributions. 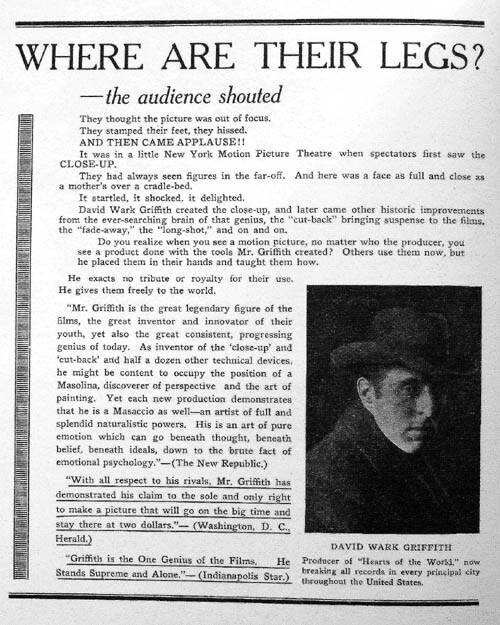 Not only did he point out that he had made several of the most noteworthy Biograph films; he also took credit for new techniques. He introduced, he claims, the close-up, sustained suspense, restrained acting, “distant views” (presumably picturesque long-shots of the action), and the “switchback,” his term for crosscutting—that editing tactic that alternates shots of different actions occurring at the same time. In the late 1970s a new generation of early-cinema scholars gave us a more nuanced account of Griffith’s place in history. They pointed out that most of the innovations he claimed either predated his Biograph work, (3) or appeared simultaneously and independently in Europe and in other American films. Some Griffith partisans had already conceded this, but they maintained that he was the great synthesizer of these devices, and that he used them with a vigor and vividness that surpassed the sources. That judgment seems right in part, but Eileen Bowser, Tom Gunning, Barry Salt, Kristin Thompson, Joyce Jesniowski, and other early-cinema researchers have drawn a more complicated picture. (4) Griffith did speed up cutting and devote an unusual number of shots to characters entering and leaving locales. But these innovations weren’t usually recognized as original by previous historians. More interestingly, much of what Griffith did was not taken up by his successors. His technique was idiosyncratic in many respects. By 1915 younger directors like Walsh, Dwan, and DeMille were forging a smoother style that would be more characteristic of mainstream storytelling cinema than Griffith’s somewhat eccentric scene breakdowns. Instead of creating film language, he spoke a forceful but often unique dialect. The New York Dramatic Mirror ad coaxes me to reflect on how filmmakers have shaped critics’ and historians’ responses to their work. 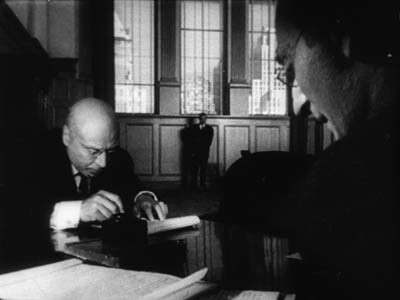 Hawks and Hitchcock developed a repertory of ideas, opinions, and anecdotes to be trotted out on any occasion. Today, directors write books, give interviews, appear on infotainment shows, and provide DVD commentary. We know that many of the talking points are planned as part of the film’s publicity campaign, and journalists dutifully follow the lead. (In Chapter 4 of The Frodo Franchise, Kristin discusses how this happened with Lord of the Rings.) For many decades, in short, filmmakers have been steering critics and viewers toward certain ways of understanding their films. How much should we be bound by the way the filmmaker positions the film? Determining intentions is tricky, of course. Still, I think that in many cases we can reconstruct a plausible sense of an artist’s purposes on the basis of the artwork, the historical context, surviving evidence, and other information. (5) This may or may not correspond to what the artist says on a particular occasion. For now, I want simply to point to one instance in which filmmakers have shaped critical uptake, with results that are both illuminating and limiting. Toland’s campaign for his style addressed the general public too. For Popular Photography he wrote an article (10) explaining again that his “pan-focus” technique captured the conditions of real-life vision, in which everything appears in sharp focus. A still broader audience encountered a Life feature in the same year (11), explaining Toland’s approach with specially-made illustrations. Two samples show selective focus, one focused on the background, the other on the foreground. Some of this publicity material made its way into French translation after the liberation of Paris, just as Kane, The Little Foxes, and other films were arriving too. Bazin and his contemporaries picked up the claims that these films broke the rules. Deep-focus cinematography became, in the hands of critics, a revolutionary new technique. They presented it as their discovery, not something laid out in the films’ publicity. But the case involved, as Huck Finn might say, some stretchers. Watching the baroque and expressionist Kane, it’s hard to square it with normal notions of realism, and we may suspect Toland of special pleading. Some of Toland’s purported innovations, such as low-angle shots showing ceilings, had been seen before. Even the signature Toland look, with cramped, deep compositions shot from below, can be found across the history of cinema before Kane. 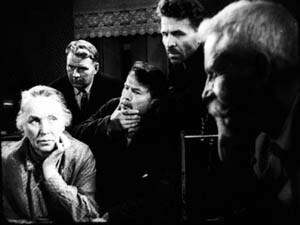 Here is a shot from the 1939 Russian film, The Great Citizen, Part 2 by Friedrich Ermler. More seriously, some of Toland’s accounts of Kane swerve close to deception. For decades people presupposed that dazzling shots like these were made with wide-angle lenses. Kane’s reliance on rephotography deals a blow to Bazin’s commitment to film as a medium committed to recording an event in front the camera. Instead, the film becomes an ancestor of the sort of extreme artificiality we now associate with computer-generated imagery. Despite these difficulties, Toland’s ideas sensitized filmmakers and critics to deep space as an expressive cinematic device. 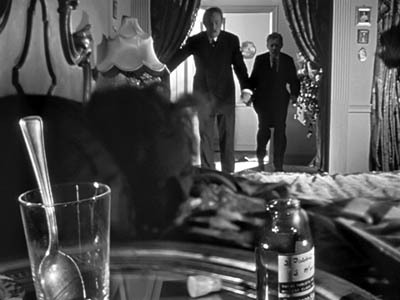 Modified forms of the deep-focus style became a major creative tradition in black-and-white cinema, lasting well into the 1960s. Bazin’s analysis certainly developed Toland’s ideas in original directions, and he creatively assimilated what Toland and his directors said into an illuminating general account of the history of film style. None of these creators and critics were probably aware of the remarkable depth apparent in pre-1920 cinema, or in Japanese and Soviet film of the 1930s. Their claims taught us to notice depth, even though we could then go on to discover examples that undercut Toland’s claims to originality. Chabrol is unusually cynical, but surely some filmmakers are strategic in this way. I’d guess that a good number of independent directors pick up on currents in the culture and more or less self-consciously link those to their film. Today, in press junkets directors can feed the same talking points to reporters over and over again. An example I discuss in the forthcoming Poetics of Cinema is the way that Chaos theory has been invoked to give weight to films centering on networks and fortuitous connections. As I read interview after interview, I thought I’d scream if I encountered one more reference to a butterfly flapping its wings. More recently, Paul Greengrass gave critics some help when he suggested that the jumpy cutting and spasmodic handheld camera of The Bourne Ultimatum suggested the protagonist’s subjective point of view–presumably, Jason’s psychological disorientation and frantic scanning of his surroundings. I expressed skepticism about this on an earlier blog entry, Anne Thompson replied on her blog, and I returned to the subject again. Any director’s statement of purpose is interesting in itself, but it should be assessed in relation to the evidence we detect onscreen. In the text we have, Feeney provides a chronological account of Mann’s career: plot synopses, thematic commentary, production background. There’s no discussion of broader historical trends, such as the migration of TV directors into film, the creative options available in 1980s-1990s Hollywood, the development of self-conscious pictorialism in modern film, the possibility of genre films becoming art-films or prestige pictures, or the changes in media culture or American society. All of these lines of inquiry would require comparing Mann with other filmmakers. 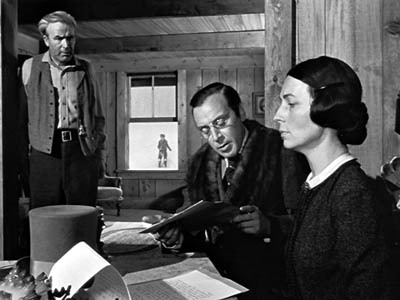 It remains for other writers, perhaps without the director’s cooperation, to put Mann’s achievement into such contexts. It’s always vital to listen to filmmakers, but we shouldn’t limit our analysis to what they highlight. We can detect things that they didn’t deliberately put into their films, and we can sometimes find traces of things they don’t know they know. For example, virtually no director has explained in detail his or her preferred mechanics for staging a scene, indicating choices about blocking, entrances and exits, actors’ business, and the like. Such craft skills are presumably so intuitive that they aren’t easy to spell out. Often we must reconstruct the director’s intuitive purposes from the regularities of what we find onscreen. (For examples, see this site here, here, and here.) And it doesn’t hurt, especially in this age of hype, to be a little skeptical and pursue what we think is interesting, whether or not a director has flagged it as worth noticing. (1) Macdonald, “Gertrud,” Esquire (December 1965), 86. (2) Quoted in Orson Welles and Peter Bogdanovich, ed. Jonathan Rosenbaum, This is Orson Welles (New York: HarperCollins, 1992), 21). (3) Such would seem to be the case of the close-up, which of course is found very early in film history. But Griffith’s idea of a close-up may not correspond to ours. More on this in a later blog, perhaps. (4) I give an overview of this rich body of research in Chapter 5 of On the History of Film Style. See also various entries in the Encyclopedia of Early Cinema, ed. Richard Abel (New York: Routledge, 2005). (5) The most detailed argument for this view I know is Paisley Livingston’s book Art and Intention: A Philosophical Study. (6) “William Wyler, or the Jansenist of Directing,” in Bazin at Work: Major Essays and Reviews from the Forties and Fifties, ed. Bert Cardullo (New York: Routledge, 1997), 8. (7) Orson Welles: A Critical View, trans. Jonathan Rosenbaum (New York: Harper and Row, 1978) 80). (8) Toland, “Realism for Citizen Kane,” American Cinematographer 22, 2 (February 1941), 54, 80. (9) See the discussion in Bordwell, Janet Staiger, and Kristin Thompson, The Classical Hollywood Cinema: Film Style and Mode of Production to 1960 (New York: Columbia University Press, 1985), 345-349. 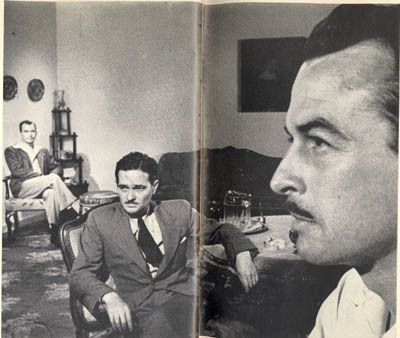 (10) Toland, “How I Broke the Rules in Citizen Kane,” Popular Photography (June 1941), 55, 90-91. (11) “Orson Welles: Once a Child Prodigy, He Has Never Quite Grown Up,” Life (May 26, 1941), 110-111. (12) Wyler, “No Magic Wand,” The Screen Writer (February 1947), 10. (13) Peter Bogdanovich was to my knowledge the first person to publish some of this information; see “The Kane Mutiny,” Esquire 77, 4 (October 1972), 99-105, 180-90. (15) “Chabrol Talks to Rui Noguera and Nicoletta Zalaffi,” Sight and Sound 40, 1 (Winter 1970-1971), 6. (16) F. X. Feeney, Michael Mann (Cologne: Taschen, 2006), 21. (17) Mann’s reasoning puzzles me. He insists that his films can’t be compared to others along any dimensions, especially thematic ones. Yet in saying that his films are lifelike, he suggests that other films aren’t as realistic as his. Moreover, what about comparisons on grounds of technique, surely one of the most striking and admired features of Mann’s work? For reasons that are obscure, the director discourages any critical consideration of style; Feeney tells us that Mann hates the very word (p. 20). Ad in Wid’s Year Book 1918. PS: 15 October: I’ve received a clarification from Paul Duncan, editor of F. X. Feeney’s Michael Mann book for Taschen. He expresses general agreement with my suggestions about how directors shape the uptake of their work, but he explains that the Mann book isn’t an instance of it. Here are the comments bearing on my blog entry. In fairness to F.X. Feeney, he only had 25,000 words to cover Mann’s career, and all the subjects you write about are really outside the scope of the book. It sounds as though these are subjects that you would like to explore, and I can’t wait to read them in a future book or blog. First, you speculate whether Mann caused the first version of the book to be scrapped, i.e. He exerted editorial control/censorship over the book. This is not the case, and if it was, do you think that he would have allowed F.X. to write that in the published version of the book? In Note 17 appended to Feeney’s quote, you write: “Yet in saying that his films are lifelike, he suggests that other films aren’t as realistic as his.” If you had continued Mann’s quote, you would have reported the following: “I don’t look at the excellent French director Jean-Pierre Melville to decide how to tell the story in Thief. I meet thieves. And I guarantee you the reason Melville’s Le Samourai 1967) has authenticity, the reason Raoul Walsh’s White Heat (1949) has authenticity, is because those film-makers knew thieves, too.” I do not see any evidence here that Mann suggests that his films are more lifelike than other directors’. Only that his films stem from life like other films stem from life. Also, in Note 17, you write: “For reasons that are obscure, the director discourages any critical consideration of style; Feeney tells us that Mann hates the very word (p. 20).” The reason Mann hates the word “style”—and I apologize for not making this clear in the book—is because after producing the Miami Vice TV show, he was forever referred to as a stylist, and the “style” of the show was all anybody ever talked about. The implication was that Mann is a director of style without substance. Subsequently, Mann has been very wary of the word, and discussion of it, because it puts undue weight on one aspect of his work. Finally, I would like to explain a little of the working method with Mann on the book. The book was researched and written during rehearsal, filming and editing of Collateral. F.X. wrote the text and was given full access to everything that Mann had said in interviews. Mann then read and annotated the text, and this was discussed face-to-face with F.X. Most of these annotations were of a factual nature, correcting dates, being precise about the sequence of events, and to correct misinterpretations of his comments in previous interviews. However, they would also bring up new comments from Mann about his work. F.X. then rewrote some texts to include Mann’s comments, and then F.X. wrote his replies. In this way, the book became more of a dialogue between Mann and F.X. and is stronger for it I feel. So, in this case, the filmmaker did not get the last word. I thank Paul for his clarifications, which should be of interest to all the book’s readers. On only two matters do we disagree. First, Feeney’s book achieves what it set out to achieve, and it deserves credit for giving us valuable information about Mann in a clear, pungent style. And no one expects a Taschen book to be an in-depth monograph covering all aspects of a director’s career. But I still think that length limits don’t prevent an author from raising the contextual issues I mention. Many articles manage to address matters that go beyond the sort of career survey that Feeney provides, so there are ways to sketch such issues in an abbreviated way. I inferred, erroneously, that the choice not to tackle them could have been related to Mann’s own views on the comparative dimension that such issues tend to rely on. Secondly, a minor matter: The fact that Mann can invoke Melville and Walsh on films about thieves suggests that a comparative perspective is valuable; he’s including himself in the company of directors who know their subjects from life, in explicit contrast to those who don’t. I didn’t include the extra sentences because I thought that they simply provided further signs of the contradiction I found in Mann’s own position—that his films can’t be compared to other directors’ works. This entry was posted on Wednesday | October 10, 2007 at 6:55 pm	and is filed under 1940s Hollywood, Books, Directors: Griffith, Directors: Welles, FILM ART (the book), Film comments, Film criticism, Film history, Film industry, Film technique, Film technique: Cinematography, Film technique: Staging, Film theory, Poetics of cinema. Responses are currently closed, but you can trackback from your own site.